Acrylic Patch Binder is a 100% acrylic emulsion that is mixed with portland cement and sand, producing a patch mix with superior flexural, adhesive and impact strength. One gallon will produce enough patch mix (when mixed with sand and cement) to fill .86 square yard (approximately 7.75 square feet) at 1/4” depth. When used as a Crack Filler: One gallon will produce enough material to fill 75-150 lineal feet of crack, depending on depth and width of crack. A patch mix with superior flexural, adhesive and impact strength. A 100% acrylic liquid binder designed for on-site mixing with sand and cement. 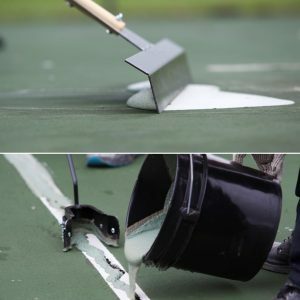 Ideal for leveling and repairing low spots and depressions up to 3/4” deep on tennis court and other sport surface pavements. 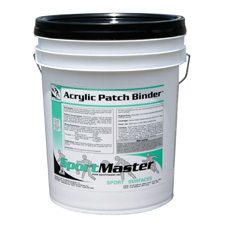 Acrylic Patch Binder can also be used for filling cracks in asphalt or concrete sport surfaces up to 1” in width. Pavement surface must be cleaned entirely of dust, dirt, debris and all loose materials. New asphalt and concrete surfaces must cure 30 days before application. Sand (40 – 60 mesh) – 100 lbs. Sand (40 – 60 mesh) – 30 lbs. Note: Thoroughly mix dry sand and cement together first before adding to Acrylic Patch Binder. Apply patch mix with smooth sided screed or trowel. Be sure to feather edges on patches. Acrylic Patch Binder patching mix should be applied in multiple lifts to achieve desired depth in patches greater than 1/2”. Mix thoroughly for only 2 to 4 minutes. DO NOT OVERMIX as this may cause excessive air entrainment and loss of strength. Surface and air temperatures must be above 50 degrees F (or 10 degrees Celsius) during application and for at least 24 hours after application for adequate curing. Allow surface to harden completely before applying coatings or opening to foot or vehicle traffic. View in Catalog 5 gal. Keg 47 lbs. 30 gal. Drum 280 lbs. 55 gal. Drum 500 lbs.